Magic Bands at Walt Disney World have only been around for a couple years and I would not be exaggerating if I said they changed the Disney experience for guests. The simple colorful bands worn around guests’ wrists are capable of so much. MagicBands use radio frequency technology and can be read by short and long-range readers throughout Disney World, which allow for endless possibilities. They definitely make traveling to Disney and spending the day at the parks much easier. Here are 5 amazing things that you can do with your MagicBand. No need to worry about carrying cash or credit cards with you while at the parks because you can add a credit card to the account linked with your MagicBand and make purchases (almost a little too easily!) 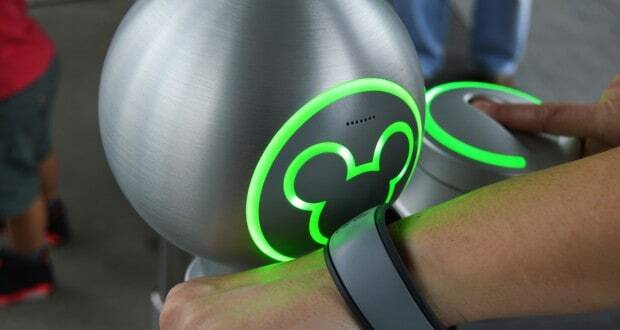 by simply touching the Mickey face on your band to the glowing Mickey at the check out counter. You can purchase souvenirs from any of the stores at the parks or resorts, and you can also purchase snacks, quick-service meals or pay for your table service meal by presenting your MagicBand to your server who will use a device to scan your band. Using your MagicBand to pay for your purchases removes the possibility of losing money, or misplacing credit cards. The added PIN also helps keep your magic band secure so only you can use it to make purchases. It also means you don’t have to bring as much with you to the park. Well not really under the sea, but they are waterproof so you don’t have to worry about getting your MagicBand wet when you get caught in those inevitable Florida showers, or on rides like Splash Mountain and Kali River Rapids. You also don’t have to worry about taking them off when you go swimming at the pool at your resort, or when you visit Blizzard Beach or Typhoon Lagoon. This also touches upon the previous point of not having to carry cash or cards with you. How great is it to not have to reach for your wallet or purse if you want to purchase lunch while at the water park? There are a number of ways that you can personalize your MagicBand. If you are staying at a Disney resort you can personalize your band before you arrive by choosing which color you would like. There are also MagicBands available at the park and online. You can purchase a plain band in the color of your choice or a band with your favorite Disney character on it, like Mickey, Elsa, Figment or even a Haunted Mansion band. They have also had limited edition MagicBands available at the parks from time to time. At D-Tech booths you can fully customize a MagicBand by picking your own color, backgrounds, characters or you can have your name printed on the outside. There are also MagicBandits sets available, which are like little decorative buttons you can snap onto your MagicBand. If none of those options appeal to you and you’re creative you can DIY and decorate your own MagicBand using paints and other materials. Many people love to personalize their band by using acrylic paint and painting their own pictures and designs onto the bands. The creative options for MagicBands are endless and it’s a great way to show your Disney side. You can link the Disney PhotoPass Service to your account through your MagicBand, so each time to you have your photo taken by a cast member don’t forget to ask them to scan your band so you can check online later and view all your photos. If you have the Memory Maker it will also be linked to your band. Not only will photos taken by cast members be linked to your account through your band, but so will attraction photos and videos. While riding The Seven Dwarfs Mine Train you wouldn’t even know that your photo is being taken, or a video, but the technology is in place to read your band and link your ride photo with your account. It’s a great way to ensure that all magical moments during your day at the park will be documented. Your MagicBand is literally your ticket into the parks. All of your essential vacation information is linked to your MagicBand, like your tickets to the parks, your Park Hopper, water park tickets, and if you are on the Disney Dining Plan, that is also stored on your band. It’s also your room key, which is why it’s great that the bands are waterproof so you don’t lock yourself out of your room when you take a dip at the resort pool. Your Fastpass+ selections are another thing that are linked to your MagicBand so when the time comes, you just have to tap your band to the glowing Mickey at the turnstile and it will give you the green light to go ahead. It may sound like a lot of personal information is accessible through your band, and it’s true, but there isn’t really a reason to take off your band during your stay so there isn’t a great risk of losing it or misplacing it, and Disney states on their website just how seriously they take handling the personal information of their guests, and they do have privacy policies in place. MagicBands are fun to use, extremely convenient and you can do so many amazing things with them that they really do seem like they have a little pixie dust in them.